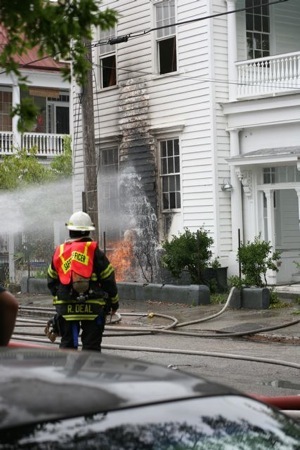 “Dude, I think that’s a gas line” was overheard just before flames began to shoot out of the front of the lovely home at 101 Spring St. For the past 8 months the home has been under heavy renovation, including the construction of a carriage house in the large back yard. The owners plans of opening a bumble and bumble salon in the antique residence where but on hold Monday due to a serious mishap. While attempting to sauter plumbing lines with a blow torch the crew accidentally put the torch on a gas line creating a giant shooting flame. 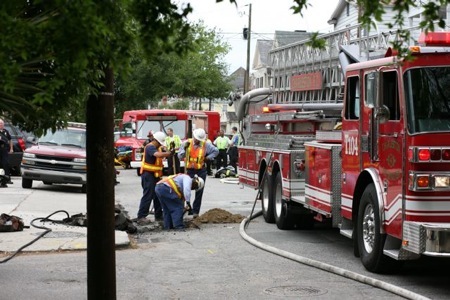 The flame was sprayed with a fire hose while the SCE&G crew jack hammered a whole in Spring St to get to a gas shut off. Neighboring business Eye Level Art owner Mike Elder is responsible for these great photos that document the event. Fireman do what they can to keep the fire from spreading. The firehouse soaks the recently renovated home to prevent it from being engulfed in flame while they wait for SCE&G to shut off the gas. 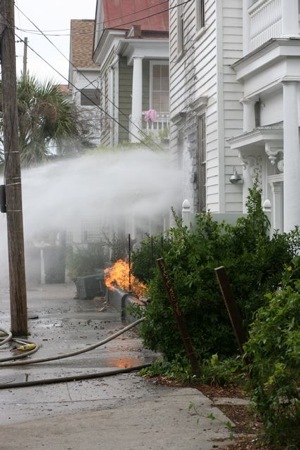 This side view shows the gas and flame shooting out, while the water tries to keep the home from catching fire. Everyone waited nervously while workers struggled to shut down the gas. Traffic was completely blocked on Spring St while firemen held the flames at bay. 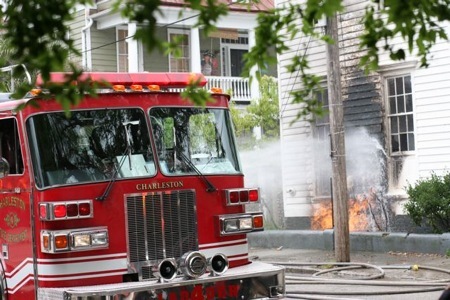 Spring St is part of the downtown Charleston commercial corridor and serves as a major artery connecting the peninsula to West of the Ashley River.